New condominiums flooded the market from 2005 to 2009 in Miami and Fort Lauderdale. An in depth analysis by Related ISG reveals over 89% of the 42,509 condos built are now sold. “The downtown Miami Brickell corridor was by far the most developed piece of real estate in Florida during the great real estate boom that occurred from 2005 to 2009,” said Kevin Dickenson with Prudential Florida Realty. In 20 city blocks, developers built 62 towers with 17,502 condo units at a cost of $10 billion dollars according to a 2011 market report by Related ISG. One development alone, Icon Brickell, represents over 10% of the new condo inventory downtown. Icon is a magnificent $1.3 billion luxury waterfront condominium project with 1800 units that was developed in 2008 by billionaire Jorge Perez of The Related Group and designed by Phillippe Starck. The three iconic 57 story towers are located on 10 prime acres adjacent to Miami Circle, Miami River and Brickell Park with unsurpassed views of Biscayne Bay. When the market turned, Perez lost two of the towers to HSBC Bank in May 2010. The bank set up an on-site sales office and sold out all 1276 units in only 18 months. “An analysis of the last 56 units sold at Icon averaged $463 per square foot,” said Dickenson. The inventory levels as of September 2011 for several major South Florida cities are shown below. 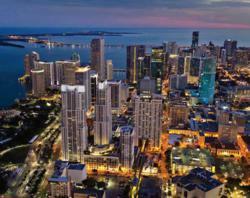 Downtown Miami Brickell is 85% sold out with only 2,897 units remaining. There were 26 new towers built in the South Beach and Miami Beach area and 77.12% are sold with only 674 units remaining. In Aventura, 10 towers were built with 1698 condo units and 93.7% are sold with only 107 units remaining. Bal Harbour only had two new towers with 725 condo units and 84.83% are sold with only 110 units available. In Sunny Isles, 11 buildings were constructed with 2,264 units and this area is 92.93% sold with only 160 condos remaining. There are 9 new towers in the Hallendale / Hollywood area with 2,238 total units and this area is now 95.67% sold out. The 97 units remaining are all at Trump Hollywood. Greater Fort Lauderdale had 5,135 units built and this area is 96.22% sold with only 194 developer units remaining. “Miami and Fort Lauderdale were the first cities to crash and it’s now clear that the area has recovered and prices are on the rise,” said Dickenson. Construction cranes are appearing on Miami’s skyline and developers are betting once again that the inventory will be consumed at much higher prices. “Miami is an international destination and that’s the key to the quick recovery,” said Dickenson. Kevin Dickenson http://www.kevindickenson.com is a Palm Beach real estate agent that specializes in commercial and residential properties from Palm Beach to South Beach.